Solon Systems Ltd are suppliers of standard and bespoke machine guarding and safety systems. 2006/95/EC relative to safety of the electric material. and have been in addition respected as far as the following harmonized regulations are applicable – UNI EN 1088:2008 safety of the machinery – interlocking devices associated with safety guards – principals of design and choice. UNI EN953:2009: safety of the machinery – safety guards – general requisites for the design and construction of fixed and mobile safety guards. BS EN ISO 12100 –1:2003 + A1:2009 Safety of machinery – basic concepts, general principles of design. BS EN 953: 1997 – A1:2009 Safety of machinery – general requirements for the design and construction of fixed and moveable guards. BS EN ISO 15667:2005 Acoustics – guidelines for noise control to enclosures and cabins. For special designed guards or for instances when customer approval is required Solon Systems Ltd or its subcontractors will provide “standard format” approval drawings in Auto Cad format. These will show the general concept of the guarding relative to the machine position. Should the customer require additional detail this must be specified prior to ordering and we reserve the right to adjust our prices accordingly. Approval drawings must be approved in writing by an authorised employee of the company by signing each drawing and providing the printed name and date of signing. Drawings must then be returned within one week of issue to ensure that manufacturing commitments from Solon Systems Ltd and its subcontractors can be maintained. Failure to return approved drawings within this time frame may affect the delivery dates. Changes made by the customer after the date of approval of guard drawings may incur additional costs. We reserve the right to pass on these additional costs to the customer. Changes must be forwarded to Solon Systems Ltd in writing by the authorised employee of the company and a revised purchase order must be issued before the changes/variations are implemented. Final manufacturing drawings will not be issued or commencement of manufacture until the signed approval drawings are received by Solon Systems Ltd and its subcontractors. 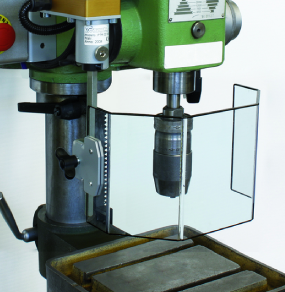 Generally the machine guards will be installed onto the machine by fixing them firmly in place with metric fixings. The machine frame will be drilled and tapped in the most appropriate place to facilitate the correct operation of the guard. This is the standard means of fitting machine guarding and safety systems. Should the customer require some other means of fixing the machine guarding in place then Solon Systems Ltd and/or its subcontractors will investigate the feasibility and provide the customer with the additional costs accordingly. Solon Systems Ltd uses approved subcontractors for the mechanical and electrical installation of the machine guards and safety systems. Details of subcontractors for this installation covered by your order are attached (Contractor Questionnaire). Guards and safety systems are installed by fitters/engineers from companies approved by Solon Systems Ltd. Each company has completed a prequalification questionnaire (copy available on request). Sponmech Safety Systems Ltd is the main subcontractor to Solon Systems Ltd. They are accredited by ISO9001 BS EN ISO 9001: 2008 – assessed for the design, manufacture and installation of safety guards. Solon Systems Ltd employ fully qualified and trained industrial electricians who are approved by Solon Systems Ltd and who have completed the prequalification questionnaire (copies available on request). Solon Systems Ltd subcontractors also maintain insurance cover for similar amounts (details on request). Customer to make machines freely available for fitting guarding and safety systems which will be installed between the hours of 8am to 5pm Monday to Friday – weekend working will be at premium rates. Contact us today to discuss Methodology & Standards. If you need any help, please fill in the form below and one of our team will get back you as soon as possible. Alternatively call us on 0121 603 1235.